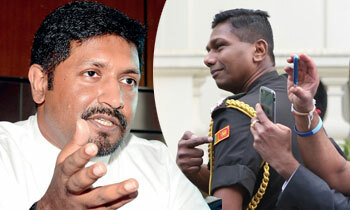 State Minister of Defense Ruwan Wijewardene today lauded Minister Counsellor (Defence) Brigadier Priyankara Fernando of the Sri Lankan High Commission in UK, for giving a signal to the pro LTTE Diaspora members whom he said are not genuinely interested in the Tamil community in Sri Lanka. “My preference is for Brigadier Fernando as he had given the right signal to pro LTTE Diaspora,” he said. The Secretary Ministry of Foreign Affairs made a request to recall him. Yes , As a Sri Lankan Brig . Priyankara acted appropriately . As a Sri Lankan living in Sri Lanka I am with you Brig . Priyankara and the Sri Lanka Army . The LTTE diaspora was trampling our flag and calling a dead man as their leader!!! Well done brigadier!! What the brigadier did was the Only way to handle Tamil terrorism, hiding in UK bribing corrupt politicians. UK should understand the language of Terrorism. In Malaysia the Tamil ltte and their cronies beat up the high Commissioner and also a monk. These cunning Tamil terrorist will do anything to condemn the Government Internationally. The people is fed up and the local Tamils have to come forward and expose these killers. These pro -terrorists talk rubbish. 500 indian fishermen , why can not Sinhalese live in North ? Are the Tamils who settled in south during the war ready to be re-settled in north ? brigadier has given a clear answer. It would be appropriate to teach the army man some diplomacy before posting to foreign missions. Army man you are referring does not represent Tamil or any other terrorist living in SL or UK.He has mastered that theory very well. Those who think of life with LTTE, must have been awaken from this jolt. It is the only language that the Tamil Terrorists will understand. Brigadier acted and communicated the message appropriately. I am living in overseas for over 30 years. This gasture is a very common which means to "stop now". It is a sort of sign languageuse use at day to day work. Look at the person he is smiling. Unfortunately this gasture was misinterpreted purposefully by pro tamil groups. his actions show that he is an uncivilised primitive sinhala savage. Govt changed the stance soon after realising the public mood. No, No, the "Brigadier" did not have any bad intensions. Just scratching his neck. Please send him some itch guard cream from the Great Nation of "Sorry" Lanka! Inviting British Royalty for Independence Day celebrations....big mistake. Their policy even today is to divide and rule. Do not make him a HERO over this incident. Next time he will jump into London streets with a Rambo Knife and slaughter the Diaspora. The Deputy Minister of Defense must act with proper insight. Sir, whatever you do,please do it in a professional way. Just don't do things unprofessionally in order to gain only a political mileage. Remember: one man's terrorist is another man's freedom fighter. Long live principles of Ex President Mandela of Sth Africa..
To Minister Ruwan,Her Majesty's government does not want any one, let alone a guest of UK Govt,. behaving in the manner that Brigadier has acted on the streets of London. So what answer you have for the UK government? Just for a moment think the protestors were ISIS. God help, British secret service, Scotland Yard would have been all over. Terrorism matters to West when white people die. Our LTTE issue is arm chair viewing for British. This is called - Hypocrisy and we will have to keep on battling alone.